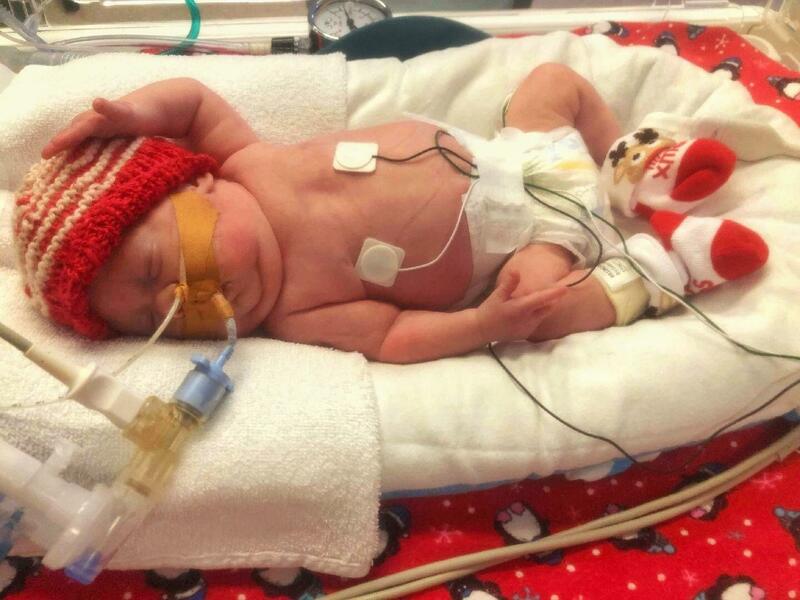 Please help us care for our tiniest patients this Christmas. When your child is just so unwell, you have to trust the hospital. And at Royal Brisbane and Women’s Brisbane, you only get the highest level of care. This place is absolutely incredible. Ari, wearing her My First Christmas socks. It’s not going to be the Christmas Lauren and Callum had expected. They thought they’d be preparing for a new baby – their first – who was due to arrive on January 6. Instead, they’re planning to spend most of the day here at Royal Brisbane and Women’s Hospital in the Neonatal Intensive Care Unit (NICU) celebrating their daughters Ari first Christmas. Baby Ari was delivered by emergency caesarean at just 24 weeks – dangerously early. “My pregnancy had been a little troubled, but I wasn’t prepared for Ari’s shocking, distressing birth”. Lauren recalled. “I woke up about 02:00 o’clock one morning in agony, and then my waters broke. Because it was so early in the pregnancy, they sent me to Royal Brisbane. I had an infection and a blood clot behind the placenta so they needed to get the baby out. Lauren didn’t get to hold her baby against her skin, look at impossibly perfect tiny fingers, or wonder at her and husbands Callum’s amazing creation. Ari was so little and fragile that she couldn’t be moved from the high-tech incubator that kept her temperature consistent and oxygen moving through her underdeveloped lungs and her brain. Lauren could only look at her baby and will her to survive. “She had a lot of issues in that first week. It could have gone really badly at any time and we had some awful days. It was two weeks before Lauren and Callum could even hold their baby. That was in late September, and since then they have become a part of the NICU extended ‘family’ – the loving, hopeful, anxious parents whose babies need round-the-clock intensive care. – and expensive, high-tech equipment we can’t buy without help from the community. Until now, Lauren and Callum haven’t felt like buying baby things for their home. But Lauren has bought just a pair of little socks – with ‘My First Christmas’ printed on them. And she’s hoping that with Ari’s fighting spirit and the care of Royal Brisbane and Women’s Hospital, she and Callum might be able to bring home their baby next year. Neonatal Intensive Care Unit nurses and doctors are absolutely extraordinary professionals and pretty amazing human beings. But they can’t keep babies alive without equipment. The Neonatal ICU has a list of equipment that’s urgently needed to help babies and families next year. It includes constant-use items which need to be replaced or upgraded often – like the incubators that Ari is in. The list also includes a pre-term resuscitation simulator and video laryngoscope so staff can learn how to do really delicate procedures on tiny bodies. Without the generosity of the community, Royal Brisbane and Women’s Hospital could not purchase essential equipment, train and upskill our staff, and make this facility the world-class Hospital. Every dollar given this Christmas will make a difference for patients and families, just like Lauren, Callum and Ari.